Conrad Graf, c. 1828-1829, Vienna. 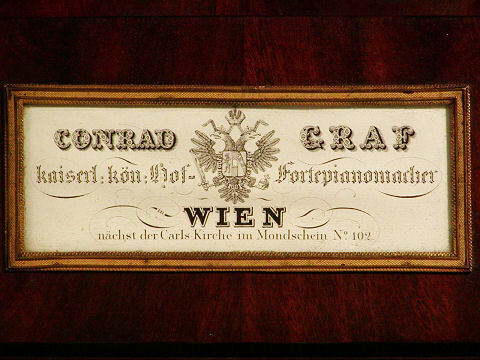 Graf's pianos were held in the highest regard by pianists playing in Vienna. Graf's instruments were played by Chopin, Mendelssohn, Robert and Clara Schumann, and, later, Liszt. This particular instrument is reputed to have belonged to a distinguished family of Viennese music patrons, the Sonnleithners, who would have had the best the builder could offer. It is in almost original condition, with all but a few of its original strings.